Manufacture and sales of rolling products, casting products, forged products and processed products of nonferrous metals, including aluminum and copper, and alloys thereof. UACJ’s Sheet Metal Operations Division boasts some of the finest manufacturing capabilities in the world. This includes precision thickness technologies of the highest standard, and one of the world’s largest rolling machines, capable of producing lengths of 400 m and widths of 4.3 m. Using a combination of sophisticated manufacturing technologies, expertise amassed over many years, and thorough quality assurance, we are able to supply products optimized to meet customer needs across a wide range of fields. Molding design is the key factor that determines the quality of extruded products. Fortunately, UACJ is home to a large number of world-leading design engineers. These highly experienced professionals are capable of designing and manufacturing extruded products for various industries and needs, including automotive, industrial machinery, aeronautics, and office machinery. Our dedicated personnel utilize the state-of-the-art technologies available at our production sites both in Japan and abroad to meet the demand for ever higher quality. 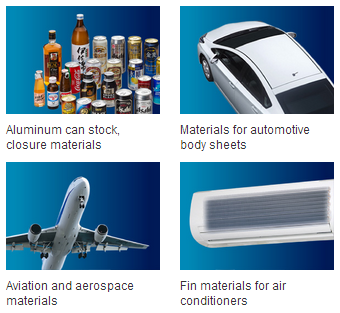 UACJ offers high-quality aluminum foil for use in a variety of fields. 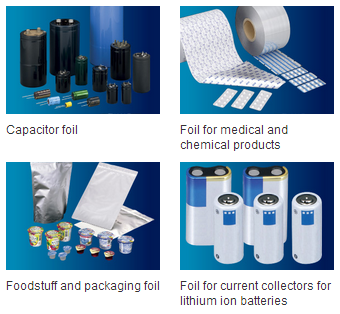 Applications range from everyday items such as aluminum foil for home-use, to packaging materials for foodstuffs and medicines, to industrial hardware such as electrolytic capacitors and battery electrode materials. With the mounting challenge of environmental and energy concerns, products such as fuel cells and storage batteries are growing in importance. Reflecting this trend, we develop and supply foil products to meet the increasingly sophisticated needs of the battery industry for items such as lithium ion battery current collectors. Thanks to our precision casting technologies, we have been able to produce a turbo charger compressor wheel that currently holds a number one share in the world market. We also maintain one of Japan’s largest forging presses, uniquely positioning us to meet the need for large-scale forgings. In our tubing operations, we are able to draw on over a century of amassed technology and expertise to produce high-quality copper, copper alloy and titanium pipes, plus compatible goods, in a variety of shapes. Thanks to unmatched material qualities such as heat conduction, anti-corrosion, machinability and anti-bacterial properties, our products satisfy the requirements of a diverse range of fields. This includes air conditioners and other heating and cooling equipment, hot/cold water supply pipes, automotive pipes, medical device pipes, and even heat pipes for cooling electronic equipment. We pride ourselves on our comprehensive range of equipment and technologies, which enable us to meet processing needs from molding to bonding, surface treatment and coating. Our products are available in an extensive selection of sizes, shapes and functionalities, effectively meeting the needs of a wide variety of industries. Constellium N.V. (NYSE and NYSE Euronext: CSTM) and UACJ Corporation (UACJ) (5741:TSE) announced today that they have signed a Joint Venture Agreement to supply Body-in-White aluminum sheet to the North American automotive industry, following their January 2014 announcement of plans to collaborate in the North American Body-in-White market. 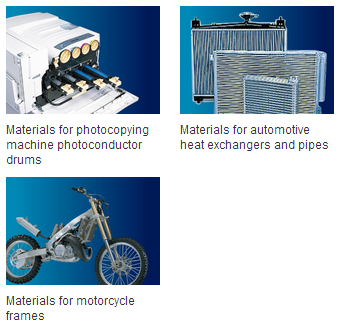 Manufacturing wires, cables, metal products – Furukawa Electric Co., Ltd.